>Media Matters complains that Fox News covers Ocasio-Cortez too much<?? What about EVERY other network in the country bashing Trump non-stop for over 2 years?? I guess it's different (of course) when the left-wing lib-tard networks do it. Of course its different. THE LEFT IS full of double standards. It is quite funny how the left complains when the right takes a page out the left’s book and does the same exact thing they do. As the gentleman above states, they are now complaining because Fox News is doing the same thing to AOC, as Media Matters and all the rest of the MSM have done to Trump since 2015! I just laugh at their stupidity. Another example: The left was dead-set on impeaching Trump for two years, dismissing the fact that there was NO evidence, but waiting on Mueller to prove Trump’s complicity with Russia and to wait for it to come out. Now that Mueller has taken away that glorious opportunity from the left, AG Barr has turned the tables to determine why the investigation took place at all. Now the left is crying foul, EVEN THOUGH AG Barr HAS EVIDENCE to PROVE it! Everything comes full circle! When the light of truth is shown on them, they cannot stand the light, as they love the darkness, as the Bible tells us. Of course the left does it.. THEY HATE IT when we do to them what they’ve been doing to us for years. JUST LIKE it was all ok for obama to do X, but heaven forbid trump do the exact same thing. She’s on Colbert’s idiotic late night show all the time. He hates Trump and always has the dems on, especially AOC. That’s because all of Colbert’s fruitcake lib-tard viewers would need therapy, time off, counseling, and a hug if he put a Republican on his show. 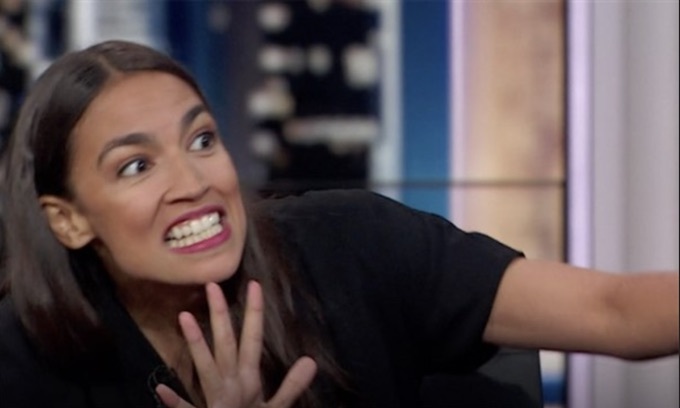 AOC, a twenty something Socialist ex NY Bartender having any say at all in running a Trillion Dollar economy requires non stop coverage. OMG, we’re going down the rabbit hole! AOC is one of the greatest advertisements for the Trump re-election campaign by vividly showing the insanity of the Democrat party and their policies. Note that all of the Democrat candidates openly endorse all of AOC’s ignorant plans. Then why did none vote YES, when the house did a role call for her green new deal? When a “politician” say and does STUPID stuff, the job of the news channels is report it. With AOC it is a hourly feat.